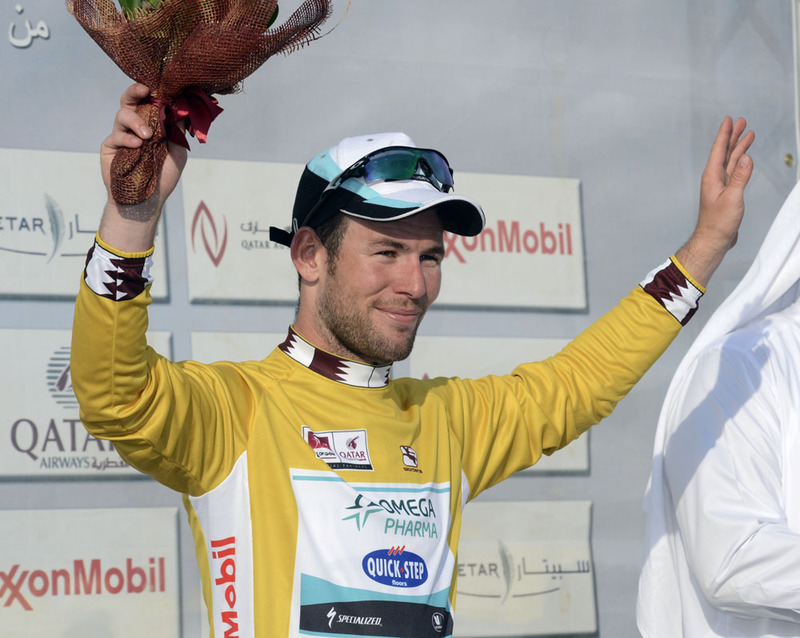 Making it three in a row, Mark Cavendish (Omega Pharma-QuickStep) won the fifth and penultimate stage of the Tour of Qatar and is now poised to claim the overall title, for what would be the second and biggest stage race victory of his professional career. It was the closest of his three wins, with Ag2r’s Belarusian sprinter Yauheni Hutarovich finishing fast and almost catching him on the line. “It was the most unpredictable one,” said Cavendish. A surprise early two-man move featured Edvald Boasson Hagen of Team Sky, though his escape didn’t last too long. Finally a five-man break went clear, including Martin Elmigar, the IAM rider who was second on stage one. “Everybody wanted to be in the break so it was hard,” explained Cavendish, “then when it went we hit a crosswind so I had to be surrounded by four or five guys. They’re big guys and they surrounded me the whole day, so I never felt the wind at all. In the intermediate sprint, with two laps of a 14km finishing circuit remaining, Cavendish won the time bonus ahead of Bernhard Eisel (Team Sky) and Taylor Phinney (BMC), who both remain in contention overall. Cavendish’s teammate Niki Terpstra was also up there, and in sprinting this quartet clipped off the front of the bunch. But while Cavendish immediately sat up – despite Terpstra urging him to persist with the move – the others carried on, with Terpstra a passenger. Behind the Eisel-Phinney escape there was no panic, and, once they were caught, Terpstra reverted to lead-out man, second last man in the OPQS train. It was a fast, tailwind-assisted finish, and Cavendish left his final effort late — almost too late judging by Hutarovich’s finishing speed. Having previously won stages but never challenged for the overall title at the Tour of Qatar, Cavendish suggested the main difference this year is that “Tom’s not here” — meaning his teammate Tom Boonen. The plan will be the same on Friday’s final stage, from the Sealine beach resort back to Doha, with several laps of the Corniche to end the race. With a 15-second buffer between him and second-placed Brent Bookwalter, Cavendish only needs to finish safely in the bunch. But after crashing heavily in the final 200 metres of this stage last year, few would bet against him claiming his fourth win on the Corniche to put a golden seal on the overall title.